With candour, humour and warmth, legendary musician, actress, activist, and icon Olivia Newton-John reveals her life story – from her unforgettable rise to fame in the classic musical Grease to her passionate advocacy for health and wellness in light of her battles with cancer. Perfect for fans of Tina Turner’s My Love Story and Sally Field’s In Pieces, this international bestseller is an extraordinary can’t-miss memoir. In addition to her music and screen successes, Olivia is perhaps best known for her strength, courage and grace. After her own personal journeys with cancer, she has thrived and become an inspiration for millions around the world. A tireless advocate for countless charities, her true passion is as the founding champion of the Olivia Newton-John Cancer Wellness & Research Centre in her hometown of Melbourne, Australia. Olivia has always radiated joy, hope and compassion – determined to be a force for good in the world. Now she is sharing her journey, from Melbourne schoolgirl to international superstar, in this deeply personal book. 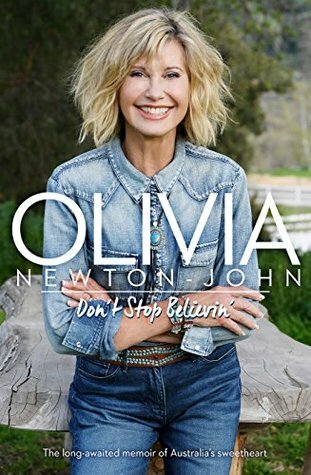 Warm, candid and moving, Don’t Stop Believin' is Olivia Newton-John's story in her own words for the very first time. Olivia Newton-John, AO, OBE is an English-Australian singer, songwriter, actress, entrepreneur, and activist. She is a four-time Grammy award winner who has amassed five number-one and ten other top ten Billboard Hot 100 singles, and two number-one Billboard 200 solo albums.